"Bad cops make the best criminals"
Both Jim and David are part of a forensic unit of LVPD. They both find it hard to make ends meet. While going through case files, he comes to know about a heavily cashed gangster and his operations. Jim investigates and finds out it's an easy hit. Jim and David scour items required for the Heist. They successfully break into the place and muffle the two occupants who live in the sketched place. They unlock the vault and find diamonds. David has a change of heart after Jim executes a hostage. David becomes attached to the other female hostage and allows her to call her 3 year old son's father. David asks Jim to leave everything as it is, because he feels different. Jim threatens him. He at first goes along, but he is disturbed. Later he kills Jim in a shoot-out and puts all the diamonds back. David drives off with the hostage assuring her of her freedom. Later, David sees two vans following him and he notices the phone number advertised as the same one the hostage called earlier. Thugs from the van kill him and free their gang member. 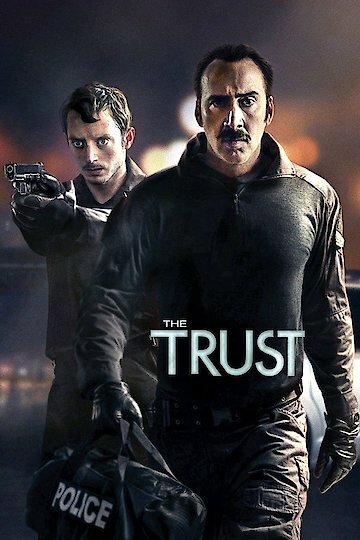 The Trust is currently available to watch and stream, download, buy on demand at Netflix, Amazon, Vudu, Google Play, FandangoNow, iTunes, YouTube VOD online.